TEDxEastEnd 2012 is an opportunity to explore the realities and ideas around our increasingly interconnected world – how we can take advantage of the benefits this produces and tackle the simultaneous challenges it presents. The line-up of the forthcoming event on Sat 13th October is impressive and I gladly accepted the invitation to join the list of speakers. My talk is scheduled at the end of the second segment (around 5pm). Tickets for TEDxEastEnd are sold out but the event will be broadcasted in live streaming from 2-7pm. A few years ago the Labour government launched a name & shame campaign against employers who employed undocumented migrants and fined them with up to £10,000 for each worker. More recently the coalition government has employed a similar strategy to tackle tax avoidance . Following what must be deemed a successful model, in a similar fashion today the Home Office Border Agency is advertising the results of its latest law & order campaign named Mayapple started in May this year. The campaign is mostly a PR operation that comes after a series of fiascos in migration and border management (some self-inflicted as in the case of the ‘net migration’ policy) that have seriously affected the reputation of the Home Office and its Border Agency. Video and photo cameras were sent with UKBA officers to film ‘law & order’ operations (maybe inspired by the experience accumulated with the participation to the UK Border Force TV series). However, this is not a PR operation for the 2000 migrants who having overstayed and/or breached the terms of their visas had to return home. One third was made of Indian citizens. The rest were mostly from Pakistan, Nigeria, China, Bangladesh and Brazil. One is left wondering if there is any rationale behind these countries of origin. A devil’s advocate may argue that there is not one rationale but three. To maximise impact and minimise troubles, the ‘illegal migrants’ were carefully cherry picked according to the following criteria: a) no women and no children because human rights activists could make a fuss; b) no citizens of rich and wealthy allies (i.e. US, Canada and Australia) because their embassies could raise a few eyebrows; c) no white people because they don’t fit the stereotype of the ‘illegal’ migrants, and, added benefit, the choice would please a section of the right-wing electoral body. There is also a further aspect to consider. As shown in an excellent piece published in the Brixton Blog, the Operation Mayapple doesn’t affect only the ‘illegal migrants’ who are eventually removed or the approval rating of Damian Green, local residents in areas that have been targeted by UKBA’s raids feel criminalised and angered by UKBA’s heavy-handiness during the arrests. After last year’s riots, the Home Office should be wary of exacerbating community relations to achieve short term political gains. Is the UKBA ‘not fit for purpose’? What purpose exactly? The reputation of the Home Office, and by extension, the UK Government, is being tarnished by the inability of the UK Border Agency to fulfil its basic functions. The findings of the report are not particularly new and come out at a time when the Home Office has already started yet another restructuring of the Agency, including its split in two separate bodies. 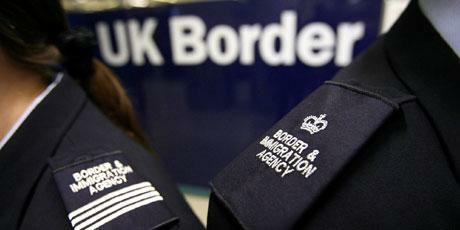 Interestingly, the UK Border Agency – responsible for securing the UK border at air, rail and sea ports and migration controls – was set up in 2008 following a very similar set of criticisms that forced the then Labour Home Secretary John Reid to declare that the Home Office’s immigration directorate was “not fit for purpose” and that a single Agency was needed to secure effective and efficient management of the UK border. This time the solution is the creation of two agencies. The recurring nature of the arguments we see in today’s report prompts me to take a step back and ask what or who exactly is “not fit for purpose”? To answer this question, it may be worth spending a few words on the criteria on which the purposefulness of UKBA is being assessed. I will refer in particular to three criticisms highlighted in the report: the slowness to remove foreign national prisoners from the UK, the concern with the high rate of appeals brought against UKBA’s decisions which are decided against the Agency, and the large number of unresolved immigration cases still awaiting decision. First, removing foreign national prisoners is more complicated (morally and practically) that the tabloid headlines and many politicians let us believe. Figures from the Independent Chief Inspector of the UKBA show that in the 12 months to February 2011 32% of appeals lodged by foreign national prisoners against deportation were successful. UKBA’s decisions were overturned in 425 cases in total mainly on the grounds that prisoners had established long-term links to the UK (Article 8 of HRA) – many, to put it crudely, are UK’s born and bred criminals. The Chief Inspector’s report also notes that by January 2011, over 1,600 foreign national prisoners were detained under immigration powers at the end of their custodial sentence pending deportation, with the average length of detention increasing from 143 days in February 2010 to 190 days in January 2011. The main reason for this is that people come from countries that are not necessarily keen to get individuals that have committed serious crimes back on their territory and deportation is therefore impossible to arrange. Besides these practical limitations that make removal difficult, it is striking the absence in mainstream political/public debate of any considerations of the moral and broader societal significance of deporting individuals that, having committed a crime, through imprisonment have paid their debt with justice and, instead of being given another chance (was not imprisonment meant to be a tool for rehabilitation?) are punished three times: first, with imprisonment, then with pre-deportation detention and finally by being forcibly removed to another country. Second, the report criticises the UKBA because ‘[it] is still losing almost half of the appeals brought against it’ and recommends that ‘systems must be put in place to improve the Border Agency’s appeal figures’. Should the Home Affairs Committee be concerned instead with the fact that a large number of migrants are kept in uncertainty and destitution for a long time because a significant number of UKBA’s initial decisions are wrong? Is the Home Affairs Committee implicitly questioning and undermining the fairness of the British Judicial system? Does this line of argument ultimately endorse the coalition government’s draconian cuts to legal aid as a tool for securing higher success figures for the UKBA? Third, the Case Resolution Directorate was set up to review the backlog of over 500,000 unresolved immigration and asylum cases cumulated over the last decade. The fact that most of these cases were pending and/or unresolved over a long time should have alerted politicians on their complexity, instead current political debate has being focusing obsessively on the date for the completion of the review. Not surprisingly the Case Resolution Directorate that had to rush through thousand of cases in a short time ended up with over half of the cases filled in the ‘other action required’ category, including 98,000 in ‘control archive’. But there is also another aspect related to the backlog that is missing in current debate, despite the attempts of current government to blame for the backlog the previous one, the reality is that immigration policy continues to produce irregular residents and in-between cases. To conclude, the quotes that Keith Vaz fed to the press regarding the report encapsulate the nature of the political debate in the country, in particular the consensus between the main parties in terms of stated political goals and values on immigration. This consensus confines the space for political dialectics to a discussion on the capacity or incapacity of the ruling government to deliver or not what they all agree, which conveniently diverts attention from the politician to the bureaucrat and in due course will bring to yet another restructuring of the Home Office’s immigration sector. It seems to me that what need to be reassessed are the goals of UK’s immigration policy and that yet another restructuring of the UKBA can do little to solve the problems that political parties are creating by failing to understand and approach international human mobility outside the limited frame of securitisation and under the duress of looming (Tabloid-fed) moral panic. Meeting the health needs of a growing and super-diverse foreign-born population in the UK is a challenge for health services. However, these needs are currently only partially acknowledged and addressed. As Jayaweera (2010: 1) points out, government policy ‘has focused largely on addressing ethnic inequality in health’, leaving aside other factors that may have an impact on migrants’ health needs and experiences of the healthcare system such as country of birth, language, length of residence and, significantly for the purpose of this study, immigration status. Charging women for maternity care has the effect of deterring women from accessing care, irrespective of formal rules requiring care to be provided even if the woman cannot pay in advance. Many women with limited resources are not prepared to take on a debt which they are unable to pay. To avoid the debt, they do not access services until they go into labour or something goes wrong. 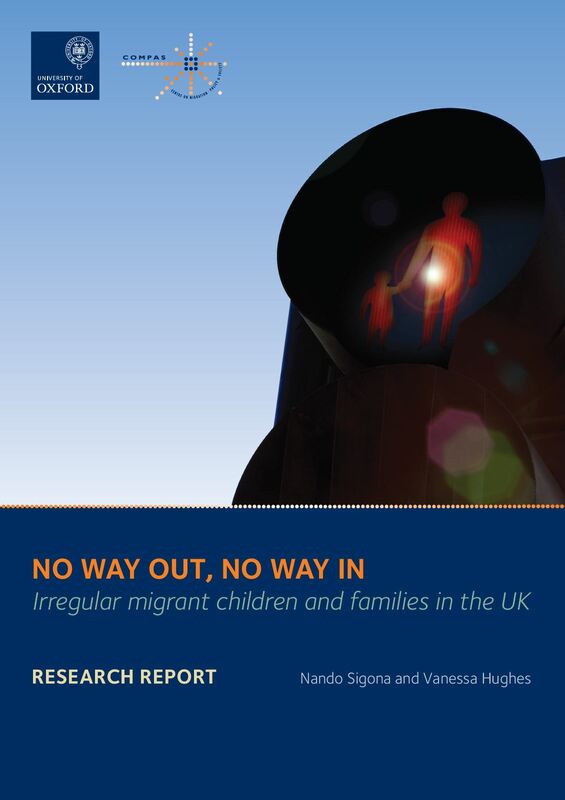 Drawing on interviews with migrant children and parents, No way out, no way in offers qualitative insights into the impacts of undocumentedness on irregular migrant children’s health status.